Or in non-Rhode Island speak, have you eaten yet? Yep, it’s state night and we’re sticking with our “island” theme for the week. Okay, it’s not an actual island as Mr. N now knows, but we’ve already done Hawaii, and besides we miss New England. As for Rhode Island, well we knew right away what meal we’d whip up for this adventure. Any guesses? 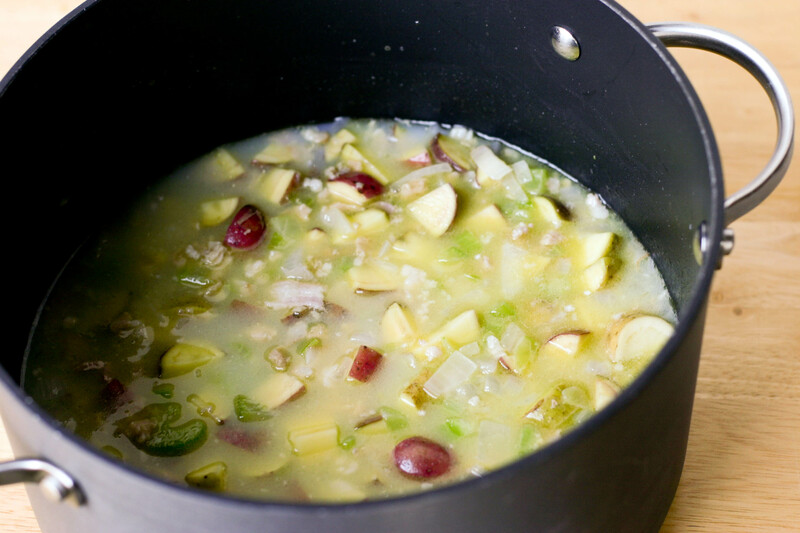 Alright, how many of you guessed Rhode Island Clam Chowder? If you did, yay! You’re right. Now, how many of you knew that Rhode Island Clam Chowder is not a red chowder, not a white chowder, but traditionally a clear broth chowder? That’s right, tourists often go for and favor the traditional New England white clam chowders, but Rhode Islanders can be found digging in on a version that puts the clams center stage. 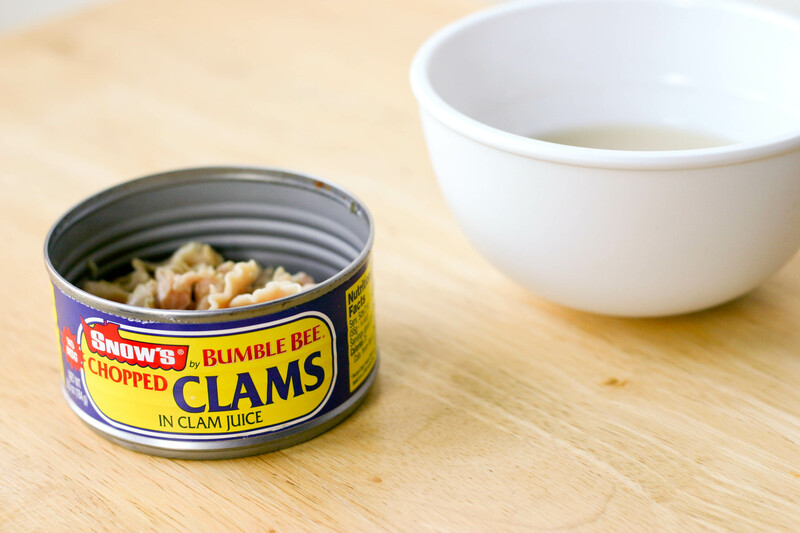 Now a true Rhode Island Clam Chowder uses quahogs, but we couldn’t find any so we’re making due with chopped canned clams in clam juice. If like us, you have to go the canned clam route, make sure to get them in the juice. You’ll need that for the broth, but we’ll get to that in a bit. First we started by heating a bit of butter and olive oil in a large stock pot. 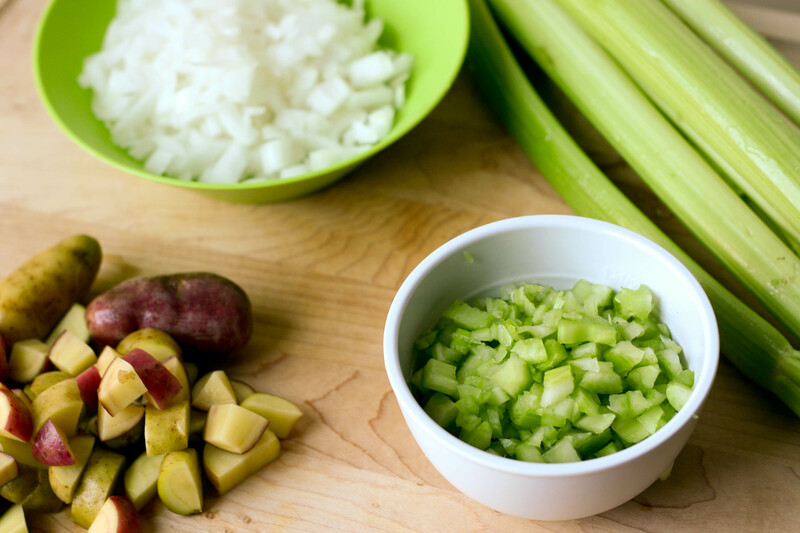 Next we gathered our chopped onions, celery and fingerling potatoes. Mr. N took care of chopping up a few slices of bacon for us (with a little help). 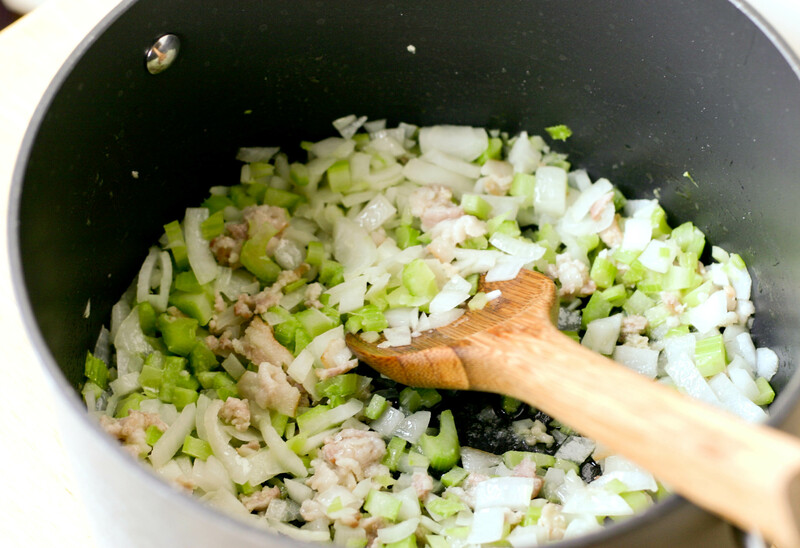 Then, once our butter was melted and oil was hot, we tossed in the bacon, celery and onions as well as a bit of sea salt to bring out the flavors. After about eight minutes, when the veggies were softened and bacon a bit crispy, we added in the potatoes, clams, clam juice and some dried thyme. We then added enough water to just cover the ingredients. We brought the chowder to a boil, covered and simmered it for about 30 minutes. We then scooped out the soup and served it with a bit of fresh ground pepper and a side of toasted bread with sage pesto. And there you have it, the traditional, clear broth, Rhode Island Clam Chowder – a 40 minute meal. The results of this recipe totally surprised us. We were a bit nervous that the clams would be too over-powering for the kids, and as I mentioned to Kelly yesterday, I’m not big on chunky soups (she posted one that might convert me though). The kids, however, both ate their soups (well, Miss A at the clams) and gave it 2 spoons. They wouldn’t be too excited to eat it again, but they thought it was okay. As for Mike and I, we were a little confused about giving a soup 4 spoons – it is after all a soup – but ultimately this soup earned it. The full four spoons! The clam flavor was definitely center stage, but not over-powering, and the hint of thyme was perfection. Now if only we had some stuffies and a cabinet, our meal would be complete. Maybe next time. So if you’re in the mood for some clam chowder, we suggest you become a Rhode Islander for the night. Besides, it’s fun to drop your “r’s” every now and then. And speaking of fun, we’ve finally jumped on the Facebook bandwagon. If you’re on Facebook, stop by and “like” us. We’d appreciate the love, and if you’re on FB we’ll make sure to “like” you back. Oh, and while you’re in a “liking” mood, stop on by Yummly and vote for fellow blogger Geni’s Red Velvet Vampire Cupcakes that are up for an award. If you aren’t familiar with Geni, she’s a fantastic baker with a great sense of humor. Her posts always make me smile, not to mention several of her meals now regularly show up on the table around here. I’m still dreaming about her sweet potato soup! Okay, that’s enough chatter for tonight. I’m off to grab a pumpkin muffin topped with some jimmies (anyone?). I have been catching up on everything that I have missed while traveling in Europe. Do you know what I enjoy most about your delightful blog…it always puts a smile on my face. When you are old and don’t want to cook anymore you are going to have children that will make you meals from all over the world and the meals will bring back wonderful memories. Sp precious and special. So glad you’re on Facebook! I’m still pretty new to the fan page thing as well. This soup sounds delicious, Kristy. It’s cooling down a bit here in CA, so this would be a wonderful dinner. Look, now as I say that tomorrow is going to be 100 degrees. I really wouldn’t be surprised! You know it probably will. That’s always how it goes isn’t it?! LOL. Sounds like a great soup – filled with lovely flavors and all things good – I never knew Rhode Island had it’s own chowder!! What a refreshing take on the chowder, Kristy, nice to see that there is no cream used in the recipe (I just find it’s too rich for me!). Welcome to Facebook, hope you get ‘liked’ a lot. Sadly I am slowly phasing out, it’s just a little creepy the way they track you on line. Mmm, clam chowder sounds really good right about now – and I’ve never had it RI (broth) style. 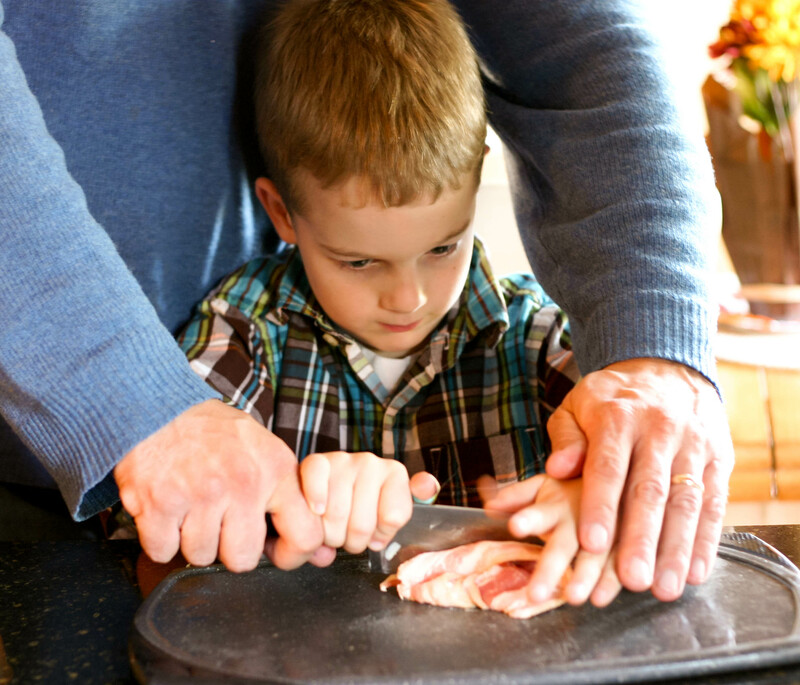 Sounds very interesting – and how much do I love that you include your whole family in cooking! LOL. I can totally relate to your husband. I’m the same way when it comes to soups (very picky). This one though – YUM! You may be the first non-Rhode Islander I know of who knows that Rhode Island-style chowder exists. You may also be the first non-New Englander I know of who knows what “jeet” means. (The rest of the exchange goes “No. Joo?” (No, did you? ); “No. Sko.” (No, let’s go.)) Cheers from the Ocean State! I love it! I’m going to have to remember (and use) this exchange sometime. 🙂 Thank you so much for stopping by and the wonderful compliment. I now have 2 Rhode Islanders that approve of this, so it must be a good one. I know we sure enjoyed it. It’s by far my favorite chowder! I love how focused the kids always are when they’re helping out. Love this recipe too. And good to see you on Facebook. LOL. They sure can be focused. When they want to that is… 😉 Thanks Greg! I didn’t know Rhode Island had their own clam chowder! Good to know 🙂 It looks delicious, and it must be quite impressive to have gotten 4 spoons!! Ha-ha, the “jeet” is too funny….hadn’t heard that before. Thanks for the mention Kristy! 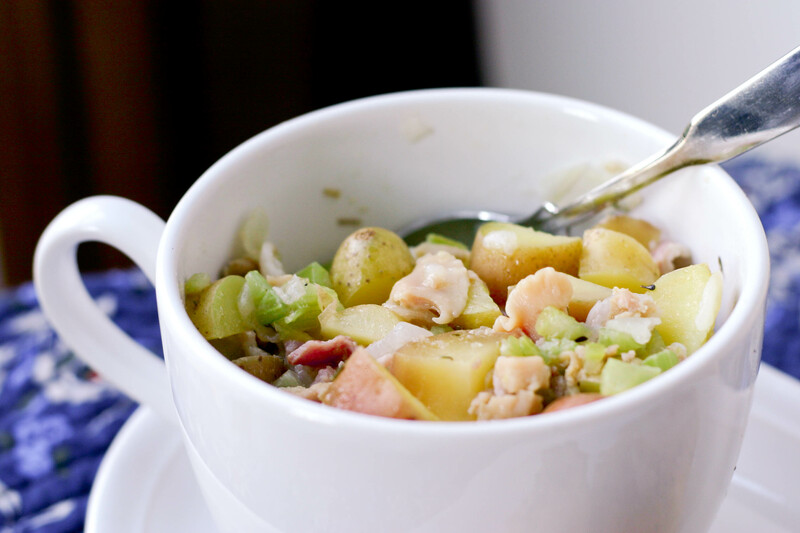 There’s nothing like a hearty clam chowder and I have to say, this version looks fantastic. I have never made my own clam chowder though we’ve certainly enjoyed it many times in Maine. I love all of your delicious additions including the bacon, celery and thyme. Mmm…. (I thought the red potato pieces in the soup were red grapes at first!). I don’t think I’ve seen you and/or Chef Dad give very many 4 spoon designations before… I better make this one! This looks great! I like how this version uses a clear broth, I’m not a creamy type of person when it comes to soups. Mr. N must be so excited to be in the kitchen, especially using a big knife to chop up some bacon! I noticed that you were on FB yesterday and liked your page! Congrats and hope you get many more fans! Four spoons?! This must be quite the soup! I’ve actually never tried clams – wouldn’t even know what they are in French… must look them up, and actually, I didn’t even know Quahog(s) were a real thing. I thought it was just the name of the town in Family Guy, lol :p I love thin soups though – thin, brothy style, chunky soups are so awesome… Really satisfying, and I’m a massive fan of celery so I’m happy to see that going in too! By the way – did you ever try cutting bacon with scissors (or meat shears)? I personally find it way easier than using a knife! LOL! I didn’t know quahogs were a real thing either. And I don’t think I’ve ever met a celery fan. You just fascinate me. 😉 Celery is one of those things that I love in certain instances, but can’t stand in others. If you come across canned clams or quahogs, you’ll have to give this a try. I think you’ll really enjoy it. As for the bread – it’s to die for. Mr. N and I both are major fans. We took a baguette, sliced it and spread around some sage pesto – basically olive oil, garlic, fresh chopped sage, parmesan, pine nuts, salt and rosemary. It’s not terribly tasty room temp, but heated up – OMG! Ah! I knew the state as soon as I read the title! This post made me all misty-eyed (in a good/nostalgic way). I have no interest in going back to live in lil’ Rhody again, but there’s something about the food/language/culture of the place you grew up that always sticks with you. broth chowder is the BEST in the world!!! This is really new to me; sounds fabulous! I love chunky soups…okay, I love all types of soup!! I’m even more excited with the 4 spoon ranking! I think this will definitely get on my menu round for next week. I’d never heard of this version of the classic chowder but will definitely make some. I suspect there’d be more clam flavor being there is no tomato nor cream to mask it. I’ve never seen quahogs here but I think cherrystones would work. Thanks for sharing a great recipe! Your soup looks like clam perfection. Mr. N just might be a chef someday…I mean the paid famous kind. Cuz we already know he is quite the chef.I can’t tell you how much it means to me for the nice complements and huge shout our! You have made my day! Glad to have made your day Geni! I enjoy your blog so much. 🙂 And you know, Mr. N just may be a paid chef someday. Geni is great and I voted for her.. but I definitely have to Like you on FB. I took the plunge two weeks ago and I’m still getting use to it lol. Now about this clam chowder.. it looks great. I’ve never tried it before.. can you believe that? But I;m willing to. And Mr N definitely is an artist because he cooks and makes beautiful art.. he may take over for you :). You know Kay, he just may someday. 🙂 Well, if you ever get over to RI, make sure to give this a shot. I can’t wait to get back there someday. What a wonderful comforting bowl of yumminess! Off to like your page right now. One of the best chowders around, I love it, its so full of flavour. Its nice you have clams in cans there which is good specially if clams is out of season and you are craving for it. 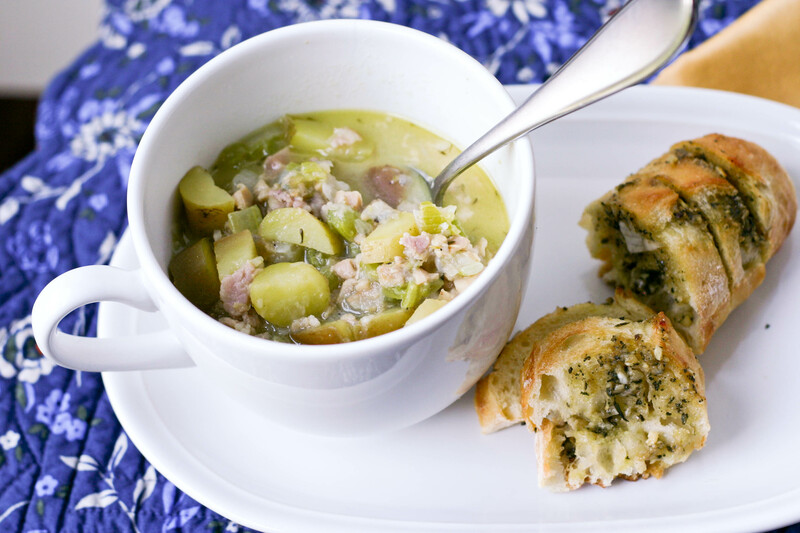 I don’t know where I’ve been – I’ve never even heard of Rhode Island Clam Chowder before! It sounds delicious, though! This was one of my all-time favorite soups–fantastic and one of the most surprisingly good things we’ve made since we started cooking around the world.